In this post, Hiroi-sensei discusses his experiences on and feelings about displaying his work in public. He touches on Edogoma being shown at museums around the world and interest from international collectors. Paula: And, um, regarding your work, do you travel within the country much for work? Paula: Business trips, etc. Do you go on many of them? For example, well, for selling the Edo tops, doing exhibitions, for example, do you do a lot of that within Japan? Hiroi: I see. It’s almost all within Japan. After I came here [to Akiu] I haven’t go out much for work, but before I came here, I did. At product exhibitions, here and there. Yeah. The Edo tops were actually the most popular [items] wherever I went. Paula: About how many times a year [did you go to them]? Hiroi: Ahh, well when there were a lot–three, four, I did them three or four times a year. Ah! Ahh, I did more than that! Ummm… among those trips, yeah, because my younger brother started going to Tokyo. Every year he put out his goods, so [my trips] were almost all-year round. Tokyo, Osaka. Because my brother went about with [his tops]. Paula: And you said that your younger brother had international exhibitions? Hiroi: Ah, yes. My brother was called abroad, to America and Europe quite a bit. Thanks to that we were quite popular. So like I said before, he was even made an honorary citizen of Seattle in America. He was even asked if he’d become an honorary citizen in New York, too, but he said he was scared so he turned it down. Mm. That’s how much importance he’s put into [our craft]. And, umm… and he was often called to museums in Germany and France, etc., and went there. I heard they even set up some special spot [for his work there]. In Finland or somewhere he was able to [display his work] in a museum. Americans and Europeans have really appreciated [our work]. It’s a shame, really… it would be good if Japanese people had a fraction of that appreciation. But it can’t be helped. Paula: This is about Sendai again, but, what are your interactions with the local community like? Do you do special activities or exhibitions? Hiroi: After I came here… After I came here I didn’t really do any, but before that… before I came here… for many years, three or four, I wonder? In front of the station there was– it’s not there anymore, but– there was a Jūjiya department store, and at the department story for three or four years every year we did an New Year’s exhibition and sale. Jūjiya was a small department store and not that many people went to it, but this Edo top exhibition, it was only at New Year’s, and people lined up for them. We hung up a huge curtain and everyone was really delighted. Jūjiya was the first time I did [an exhibition] in Sendai, and to have people lined up into the night on New Year’s, it was really something. And for three years [we did it], and the fourth year I came here, and they asked me to do it a fourth year, but I’d moved here, so I think I couldn’t do it. Then Jūjiya went bankrupt. Heh heh heh… And now… what did the store become? I think they turned it into something. Ah, it merged with Daiei… I think it merged with Daiei. Anyway, the store isn’t there anymore. The department store. Jūjiya was the one I did grand exhibitions at for three years, and after that… after that I didn’t really do any. After that there were sometimes kokeshi-maker or product exhibitions, but we always did that as a group. There weren’t many. Then I moved here, so. But even if I didn’t do that kind of thing, people who liked [the tops] requested them and lots of people came to the shop, so there was no inconvenience to selling them. And after moving here, since moving here people came steadily [to the shop]. Paula: And did you have any chances to do an international exhibition? Hiroi: Ahh… international. I don’t really… don’t really know. Umm… there were some things. Not direct [opportunities], but people who collected [the tops], umm… where was it? Not America. Somewhere in Europe, France…? Ahh, Germany. A German museum… they said they would do an exhibition. [They asked] if I’d contribute what I had and exhibit them. Just exhibit them. After that a German person came, and it was the museum person, and they saw my works and bought a number of them. After, the interesting thing was that in France– where was it? Uhh, the sister city with Sendai. Hm? What was it called? Umm… what was it… eh? I’ve forgotten the name. The sister city with Sendai… uhh… wait, Rennes, Rennes…? Rennes?? Rennes, I think it was called Rennes. I don’t really remember the name. It might be Rennes. He said the mayor [of Rennes] was collecting tops. And he wanted Edo tops, and for cultural exchange artisans from that city, people from Rennes, had come from Rennes to Sendai. And a number of Sendai city councillors had come with him to the craft village. And they went there and from here I could see them talking [to the artisans]. And this one red-faced, enormous man pointed at me and was saying something over and over. And everyone restrained him and kept shaking him off and he rushed off in quite a hurry, and I was really shocked and thought, wow, we’ve become important. They’d say “Ohhh!” and that they wanted my howling top, and such. And the interpreter said said that he’d come here and collected tops, and that he had a number of Edo tops, but no matter what the cost he wanted a howling top and he’d heard that they were made in Sendai, so he definitely wanted to come. But he’d tried to come here and everyone had held him back, so he had gone out of his way to go out. And did we have howling tops? And just at the time I had some howling tops, so I gave him one as a gift, and he was really happy and went back [to France]. That sort of thing happened. Hiroi: Ahh… that was some time ago. Ten… fifteen or sixteen years ago, I think. It’s been fifteen or sixteen years. After… wait, it was early than that. Twenty years ago…? Ahh… Mm. When I did a museum exhibition was about twenty years ago. The Sendai museum. I’ve done an exhibition of these Edo tops before. What was amazing at that time was the museum exhibited all of the tops, and we asked Landis-sensei if there was something she’d use to describe the Edo tops in one word in English, and it was the first time I’d heard her use the word unbelievable [anbiriihaburu]] And the museum wrote above its entrance “Unbelievable Edo Tops.” And before long it was on television, so at the time they started saying unbelievable. It might be because of Landis-sensei that the word unbelievable spread throughout Japan at the time. Heh heh heh. Until then no one knew about that kind of thing. It was said that that word fit Edo tops perfectly. I thought, “Yeah, that’s the sort of thing they are.” It was right about… and Landis-sensei also… ummm that time was… seventeen or eighteen years ago, after all. It was after that museum exhibition, wasn’t it? When the mayor from Rennes came. Seven, seventeen or eighteen years ago. In this interview segment, Hiroi-sensei describes the life of a woodworking artisan and the difficulty of maintaining Japanese traditional arts in the modern world. Paula Curtis: What are some of the biggest difficulties you have encountered working as an artisan? Paula: (laughs) Those, well, difficult things, of course you said there are a lot of them, but did they change a lot over time? What was difficult–doing business? Selling them? Hiroi: Well, the difficulty of being an artisan, the more you do it the more difficult it becomes. Other than that, selling them, I’m bad at selling them. So, yeah, I’m always at a loss. Paula: Do you feel that artisanal professions are in danger of dying out? Why do you think that is? Hiroi: Ah! Yes. This is the thing that troubles me most. Umm… why it is that Japan takes artisans for granted. If there are no artisans, I don’t think that they can even established Japan’s large businesses, but for some reason artisans are looked down upon and taken for granted. Umm… people in administration also think little of artisans and don’t support us. I’m not saying we want [more] support, but I think we want them to value us more. But Japan right now is developing only this one [type of] skill, and maybe the bottom, you’d call it, artisans are definitely at the very bottom [of those priorities]. Artisans make things [to be used], and at this time [those things] are made in great quantities, so large companies are established. And if those artisans gradually disappear, someone will say “Let’s [make] this thing,” and they probably won’t be able to. So there are a lot of artisans of different occupations, but in any case I want those people who are artisans to be valued more. That’s my wish. Paula: Do you have a lot of apprentices compared to the past? Hiroi: Ahh, yeah. So, um, this is, well, as for why apprentices increased, it’s because I was doing traditional kokeshi, umm… and there were a number of people doing kokeshi. So there were a lot of people who gathered to do that. And I was painting kokeshi, and selling them, selling them to collectors, and people were saying difficult things to me like “that’s wrong,” “this is wrong,” and I was very troubled, but I did my best at it, and became able to [make them] to a certain extent. At that time, there was another person here like Maeda-kun whom I was teaching. He was the son of a kokeshi maker, someone from Obara Onsen, he was someone famous, and this was his child. He was named Yūsuke, Honda Yūsuke. That was in Shiroishi, and the young sons of the kokeshi makers of the Yajirō [style] lineage came together and I had seven [apprentices]. And since Yūsuke said “I’m learning [Edo top making] right now at this place,” everyone else said they wanted to, too. And so they [all] came saying, “Will you teach us?” It was like asking if it’s true and going “It’s true!” And he was saying “Come with me everyone!” Those seven came to Shiroishi and I ended up teaching them. Well then, my goods are different from kokeshi, and there’s a lot of different kinds, and you have to want to enjoy yourself, so first it was like “If you come to my home, it’s not work, it’s more like fun.” And everyone was like “Whaaat!” and was really surprised. Heh heh heh. One person really took that seriously and messed around and found a girlfriend and got married. Haha. Now, for kokeshi, the Yajirō line is the best one, but he couldn’t really make tops well. He’d been learning for almost half a year but couldn’t make them. And kokeshi, well, his parents were kokeshi makers, so, first, first it was best for him to do kokeshi [instead of tops]. So he put all his efforts into kokeshi. And everyone else was doing tops. And of course I wondered if their parents were angry, if they were complaining. I thought, “I’m teaching their precious heirs unnecessary things!” Surely they must have been mad. But their parents all came and said “Please take care of them,” and bowed their heads to me. All seven. Contrary to it all, I was the surprised one. “Ahh this is serious,” I thought, and put my all into teaching them. I think usually one person can remember about a hundred types [of tops]. Paula: Umm, about these artisanal occupations disappearing, what do you think should be done about that? So that they become more popular? Paula: Do you think there’s anything that can be done? Hiroi: I think it would be really good if they were popular. It’s regrettable that in Japan there’s not a system for that. Like I said before, if important people would take note of us artisans, wouldn’t a bit more traditional things and skills survive? And young people becoming artisans–you know there’s quite a lot of young people who want to become artisans But the world of artisans is difficult. And artisans are quite stubborn. And people are scared of that popular image, that they can’t get used to that [sort of life]. Heh heh heh. there are quite a lot of people who say “I really want to do that…” So I thought [it would be good if] it was easier for those people to become accustomed to it. I thought [to myself] “I want to teach them.” Umm… last year, a year and a half ago, in Sendai, our Craft Village, we wanted to do successor training, so the city gave us money. And five young people came. And, ah– the city gave us wages. And we got quite a bit of money as an honorarium, too. It went on for a year and a half and it ended in March of this year. In the end those who stayed on were one person with Kotake-san, and Maeda-kun here with me, and another person, Misa-chan, a girl. Three of them were left. I think that if something like that [program] went on a little longer we’d have more young people come. And if they did it without such strict conditions. This time around, the conditions weren’t so tough, and that was good. Five people came and three stayed. I think that’s a huge success. And doing something like that again, not just with the city, but with the prefecture, the country, if they did that, I think the number of young successors really go up. And, well, among the same artisans, places with money, they can steadily support young people themselves. Places like mine that don’t have any money, because of that people like Maeda-kun are doing part-time jobs but also want to learn, so they come [to us]. I think people like that can become the real thing. So I think that if [the government] extended its hand more to places like that, more young people could be trained, and I feel like Japan, too, would be a richer place for it. In this post, Janell describes how her gift for impersonation and desire to entertain led to her meeting Hiroi in Sendai. Janell [47:45] Well I started when my brother went–and my family–I was working in the summer camp, cooking, and helping to clean up and stuff. And my brother and sister and my mother and father went to New York City to visit my older sister who was working for Exxon, or Esso at that time, in the Rockefeller Center area. In the basement there, in one of those malls, he found little monkey puppets. And so he bought two and he gave me one. And that’s what started me with the puppetry. That was back in, hmm, ‘40– see, I graduated from college in ‘48, and this was before college. So around ‘45, ‘46 I started. I used to do imitations and impersonations. One time I heard on the radio, Fred Waring had one [a comedy bit] where you push buttons and change the stations and then you get a funny connection. And I had a routine using spoons pushing the button and going from one to the other and I had ZaSu Pitts and Bette Davis and roosters and all kinds of stuff. So that was what started me, and then, when I got the puppet I started with puppets then. And I have them [still], they’re getting ready, I’m going to have a little show coming up next month. But, I have them separated as to the ones that I started with, and then, when I was in Japan I met a wonderful woman who was really creative and she made me twenty-four puppets. Rabbits, and a bear, and an octopus. All kinds. Malina [49:50] What was her name? Janell [49:51] Her name was Michii Sato. And she’s gone now, but she was a wonderful friend. One of the teachers at Miyagi, Mr. Ishii, he was a teacher of Japanese and at one time the head of his department there too. He introduced me to her when I first went to Sendai after language study. And she made me a grandma and a grandpa, wonderful puppets uh, and started with that. And when I was on a TV show for a year, teaching homemakers English with Mrs. Amano’s help, uh, I had three other puppets she made me. A boy and a girl and a mother. And after every show, thirty minute show, at the close we would review what we went through with these puppets so the children would talk to their mother and answer. So, then I was asked by a man in our church in America if I could use puppets and do a Sunday school program, you know for a yearly program, but anyway at that time Michii Sato made me twenty four puppets. And I never got to use them to make that. Malina [55:45]: And you mentioned doing a TV show? How did you get into that? Janell: That was through the man that later, after that, he’s the one that got into contact with my top teacher. But when I was teaching at Miyagi in the college, I would have juniors and seniors taking a course, not compulsory. What’s the word I’m searching for? A course that elect–you elect. This one–that year I had a woman named uh, what was her name before marriage? After she graduated from Miyagi she married Mr. Amano who was working for the TBS radio and television station. And um, they asked me, they asked me to have this program for housewives. It was half an hour everyday, Monday through Friday, and Amano-san’s wife, my former student, was my associate. She would use the Japanese to translate and I would always be speaking in English. And she could use English too. So, it was funny, they asked me…they set, up until they set a date and then I thought I was finished, but um, they wanted to keep it on. And I had only gotten permission for one year from my school representative. I said, I couldn’t continue that program more than one year. But the way they had said it sounded, to them it sounded, like forever, but to me it sounded like the end. It was at that time then, that Amano-san, Mr. Amano, and his associate at TBS asked me to do this program for New Year’s with Mr. Hiroi the top maker. And that was 1981, we taped it and then it was broadcast on the 3rd of January 1982. And then I was accepted by Mr. Hiroi as an apprentice. And from that time I worked first in his home on the lathe, and then he got me in contact with a man who made a lathe for me. See ZaSu Pitts in action: view a video of her singing “Your Mother!” in 1934’s RKO Sing and Like It. See Bette Davis in one of her iconic roles, as Julie in William Wyler’s 1938 Jezebel, a Warner Brothers film. Listen to Fred Waring introduce the song “Buckle Down, Winsocki” from the musical Best Foot Forward on Command Performance in 1942, right around the time Jan would have been listening. Photographs of Janell and her puppets via Janell Landis. ゼイスー・ピッツ：1934年の RKO Sing and Like Itで“Your Mother!” という歌を歌っているヴィデオ. In this interview segment, Hiroi-sensei describes his first time meeting Janell on a New Year’s television broadcast in Sendai. He discusses the beginning of their friendship and the start of her training with him as a top-making apprentice. Paula: Was the attitude towards America and the West different in Sendai than in Tokyo? Hiroi: No, in Tokyo, Americans… well, in Tokyo I didn’t meet any Americans. It was after I came to Sendai [that I did]. Because it was after the war. Like I said before, because I was living in the mountains without knowing the war ended. So I didn’t meet any Americans in Tokyo, and after the war, I was in Sendai. And in particular, [it was only] after I met Landis-sensei that I became close to Americans. Paula: Why was it that your experience getting to know Americans—well, was that the first time? Or, did you have other American friends? Hiroi: Ahh… there weren’t any others. I had met a few [Americans]. Umm… to make something for them, that is. Mm, that was about it, and I can’t really say that I became close to them. Even if I wanted to become friends with them I couldn’t. And also, at that time I was still poor, and I was putting all my effort into making a living. Mm, Americans were like an unattainable goal, hahaha. They’d do something and I’d be like “Whoaaa, amazing!” And when I met Landis-sensei, it was because we had a chance [to meet] on a television [show]. Hiroi and Janell on a television broadcast together. 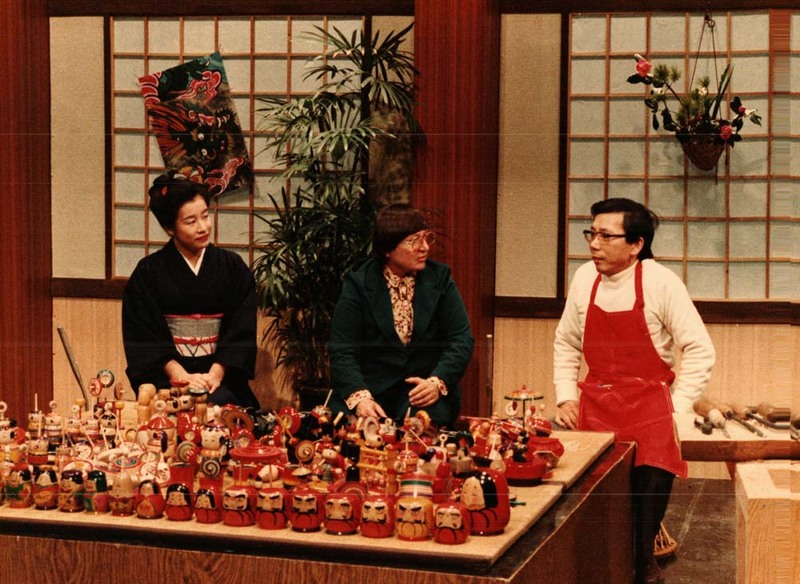 Paula: Did you often introduce those Edo tops on that television program? Hiroi: Yes, yes. I often did it. Paula: Was that an NHK program? Hiroi: I did it on NHK, too, and all of the Sendai broadcasting stations. I did all of them. I did broadcasts for the entire country on NHK and also local ones. I’ve done a lot of local shows and NHK shows, too. Also Tohoku Broadcasting. Mmm, even now I’m doing Miyagi Television’s OH! Bandesu program. They let me do that TV show a number of times. Even now I’m good friends with a man named Wakigaya-san from Miyagi Television, and Amano-san from Tohoku Broadcasting, he was a producer, I think. And Amano’s wife was a student of Landis-sensei. That was the relationship. And he said, “Next time I’ll introduce you to an American.” And then because there was free time, on a New Year’s TV program, this was a New Year’s TV program. And [Landis-sensei] and I did it together, and they told us they’d introduce us. Did we meet before that? Before the television show… hmmm… before the television show… ah, I had heard of her. Because they said they would introduce us, and we didn’t have a chance [before that]. And [they said] they’d have us do [the TV show] together. Mm, it was from that time. Paula: What sort of television show was it? Hiroi: It was a New Year’s show, and, err… what kind of things did we do? In any case it was things that were good luck for the New Year, and it was a show that also did Edo tops… I think. I don’t remember in detail what we did. What I remember is that the announcer kept getting things wrong and was corrected a lot. (laughs) I think Landis-sensei knew the whole time. Heh heh. We talked about it a lot. Paula: This will go into [the topic of] Landis-san [again], but could you talk a bit about the first time you met her? Hiroi: I think the first time I met Landis-sensei was when [we] were on television. I feel like I might have met her before that, but maybe I didn’t. I don’t remember that time well. The first… thing I remember is that time on TV, I think. But I might have met her before that. I don’t remember when that television show aired. Anyway, she was a teacher at Miyagi Gakuin, and an American who was fluent in Japanese. And she had an interest in [things like tops], so [Amano-san] said he’d bring her next time. I heard this from the show’s producer, Amano-san. After that we met on the television show, which I saw in a photograph first. I feel like we met before that, but probably that was our first meeting. I don’t clearly remember that time. Anyway, it was around that time. And she came to my home, and was really happy [to see the tops]. And that was the first time she said she wanted to make them herself. She said “Please teach me,” so I taught her. Umm yeah that’s about right. It’s hard to remember. But she really made a lot of things, Landis-sensei did. Mrs. Hiroi: Yeah. That wagon, she made that wagon thing. Hiroi: Umm, yeah. It was a wagon, a covered wagon from the pioneering times like those you see in Western films. But attached to the wagon, I thought they were horses, but Landis-sensei put oxen. I said “Shouldn’t they be horses, not oxen?” and she said, “No, they’re really oxen.” When I said “Why?”, and she said that horses can go far but they get tired easily. Oxen were slow, but they had stamina for no matter how far they go, and so for going [that far], actually it’s not a carriage but an ox cart. And so she attached oxen to the covered wagon. Mm, even now, it’s amazing. That she made that. She made so many things. Later she used the lathe by herself, and that was Karahiro-chō, right? Hiroi: There we made a cabin, a little cabin where we worked, and [made tops] there for a while. I think she [made tops] until she went back to America. Hiroi: Yeah, that’s it. She returned to America and sent her lathe there. And she said, “After I return to America I’ll [make tops] there, too,” and I said “No, you won’t remember the way to make the tools, won’t it be impossible?” and she said “No, I’ll be fine, I have friends who are skilled with machinery and cutlery, so if I ask them [when I have a problem,] I’ll get by somehow and it’ll be fine.” And she sent her lathe to America. When I asked some time ago that was the case. Hiroi: And– huh? I think she [worked on the lathe] a little in America. There are lathes in America, too, but they work a little different. And Americans find Japan’s lathes unusual, so they come to see them. Umm, actually in America, there’s a lathe association of some kind, something like a world lathe association. And there’s number of members and an association. And the president… she’s in a group that makes naruko kokeshi, and I invited the American lathe association president and her husband, the couple, and they came here. I think the wife was the president and her husband was the vice president. And there was a [cultural] exchange with the artisans who made naruko kokeshi. On their way back they stopped by here. And at that time they made these teeny tiny tops. They were tops about this big, they had become their specialty. And I thought “Man, I’ve been defeated!” and made even smaller ones. Ones this small. And I showed them to them and they said “Nope, I’ve lost!” Heh heh heh heh heh. I was like, “I wonnnnn!” Hahahaha. They burst out laughing and we shook hands. It was great fun to experience. Paula: Were you hesitant to take on Janell as an apprentice? Did you have any concerns? Hiroi: No, I didn’t really have any concerns. Mm. Actually, I thought, she’s not Japanese, and it would be wonderful if an American learned [how to make tops]. And Landis-sensei was the one. And she carved a kokeshi by hand herself, and showed me that, too. And said that she definitely wanted to carve using a lathe. And right away, on that very day, she used the lathe. And she learned a lot of things carving, but, we didn’t understand each other here and there. And it was funny, when it was a problem she’d go, “I don’t understand because I’m an American.” Heh heh heh heh. Everyone would give big belly laughs. Heh heh heh. Paula: Was that the first time you had a foreign apprentice? Hiroi: Yeah, that was the first time. Heh heh heh. Yeah.